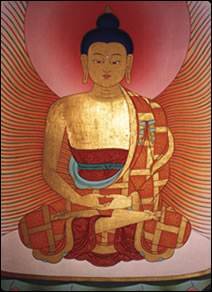 The practice of shamatha or “tranquillity” is carried out to calm down coarse thoughts and kleshas, and the practice of vipashyana or “insight” is practiced in order to see the nature of one’s mind just as it is and in that way to eradicate defects and increase qualities that abide within oneself. Generally speaking, we can divide all things into bewilderment and that which is un-bewildered. Bewilderment or ignorance is what we call samsara or “cyclic existence.” That which is un-bewildered is what we call nirvana. Vipashyana is practiced in order to recognize one’s true nature that exists in the absence of bewilderment. When one sees one’s true nature, then one realizes fruition, which is without defects and is replete with all qualities of being. But although one has recognized this nature, until one actually attains that fruition, one still has to deal with adversity; thoughts, kleshas, suffering, illness, and so on. So the next subject that I wish to speak about now is how to deal with adversity through the practice of meditation. This is called "bringing adversity to the path." There are six types of adversities, which need to be brought to the path. The first adversity is thoughts, which continue to arise and are often extremely intense. These intense thoughts can be virtuous or non-virtuous; they can be pleasant or unpleasant. In any case, if one follows a thought, one becomes more bewildered, which leads to more fixations; more fixations lead to more problems. If one applies the remedy to a thought, that thought is pacified, which leads to both temporary and ultimate happiness. So when one is meditating with a relaxed mind, whether one is practicing shamatha or vipashyana, when thoughts arise and distract, then this obstructs one’s meditative state of stillness and therefore can be an obstacle. The remedy to this is how to bring thoughts to the path. When one is meditating, eventually a thought will arise. It could be a weak thought or an intense thought; it could be a virtuous thought or a negative thought. In any case, the situation is the same. It is necessary to do something about this and there are three things one can do. The first thing is that one recognizes that a thought has arisen, and once one recognizes that a thought is present, one restrains the thought, in other words, one gets hold of it. Finally, one applies an antidote, a thought that serves as an antidote to that thought. But here, this is not what is done. That is not how one brings thoughts to the path. Another practice is to recognize that a thought has arisen and then to examine it. One questions the thought and tries to see what it is like. Here, revealing the nature of the thought through analysis is also not what is done. A third thing that may occur is that when a thought arises, one just acknowledges that it has arisen and then lets go of it - it will dissolve if one does. That is also not bringing the thought to the path. How does one practice correctly? When a thought arises, one recognizes that it has arisen, but one doesn 't try to stop or get rid of it; one doesn’t follow the thought either, i.e., one doesn’t try to alter the thought or the presence of the thought in one’s mind in any way. One doesn’t examine or analyse the thought either. All one does in a relaxed way is look directly at it. When one looks directly at the thought, one will notice that it disappears. But even before the thought has disappeared, one will see its nature, which is beyond conceptuality. As soon as one sees the nature of the thought, even though the thought is still present, it has become meditation. That is how to bring thoughts to the path. When one attempts to look at thoughts as a beginner, particularly intense thoughts, one may feel uncomfortable. It may seem somewhat unnatural, but if one continues to apply the practice, it will eventually become quite natural and be an effective way to enter into meditation even in the midst of thoughts. Once one is experienced with this, then one will have the habit of looking directly at the nature of a thought as soon it arises and the practice will become quite easy. The second type of adversity to be brought to the path is kleshas or “mental afflictions.” Kleshas are thoughts, but they are a specific type of thought that are problematic. We consider them problematic or even poisonous because they cause suffering and indirectly they cause others suffering as well. According to Lord Buddha 's teachings in both the Sutras and Tantras, all kleshas or mental afflictions can be summed up in five categories, which can be further reduced to three. These are usually referred to as the five poisons or the three poisons because they are poisonous if they are not remedied. The first klesha is attachment, which can be attachment to food, wealth, pleasure, people, places, and so on. It is poisonous because being attached to something causes suffering. The second klesha is aggression. Aggression has many varieties, such as hatred, holding a grudge, spite, malevolence, and so on. All of these are varieties of kleshas. The third klesha is apathy, which is a state that arises from ignorance or mental dullness. The fourth klesha is pride, which in this case is holding oneself to have qualities that one doesn’t have. And the fifth is jealousy, which is being unable to tolerate the good things that others have and enjoy. It 's being bothered by the good qualities of others, being bothered by their wealth, pleasure, and the like. The five types of kleshas do not normally arise simultaneously. The reason we consider the kleshas problems is that they can simply ruin one’s life. They can certainly ruin one’s practice of Dharma, especially one’s practice of meditation. So the first step, of course, is to recognize that a klesha has arisen. Normally one doesn 't recognize even that. Normally when a klesha arises it takes hold of one before one is even prepared to admit that it has arisen. At this point, having learned what the kleshas are and having come to admit that they arise have prepared one to recognize and acknowledge them when they do arise. Although one recognizes the arising of the klesha, and although normally one considers them poisonous and problematic, one doesn 't try to stop or get rid of the a klesha when it arises. The approach here is identical to that with thoughts in general. When a klesha arises and one recognizes that it has arisen in one’s mind, one doesn 't try to chase it away or stop it; one doesn’t indulge in it either. One doesn’t need to stop it, because the nature of the klesha is empty - the same as the nature of thought, the same as the nature of mind. So therefore once one has recognized the arising of whatever klesha it is, then one simply looks directly at its nature without altering anything, without attempting to alter one’s mind or the klesha. As one looks at its nature, one will experience and recognize its nature. In order to do this, though, one’s mind needs to be somewhat relaxed, but also one needs to have a lucid awareness. With awareness, one sees that the nature of a klesha is the same as in the above case with thoughts. While the klesha does not particularly disappear just because its nature is recognized, nevertheless, it is no longer poisonous or problematic, and even while it is present, it becomes an aid to meditation before it has vanished all on its own. The third type of adversity to be brought to the path is gods and demons. Now gods and demons here refer to a category of experience, i.e., to all kinds of hallucinations and paranormal experiences, which some people regard as the influence of actual external beings that we would classify as gods and demons. There are also other types of experiences that are not particularly paranormal but still give rise to intense fear. So basically what is called “gods and demons” here means experiences of intense fear. Now fear can arise for a good reason. There may be something to be afraid of. But sometimes fear arises for no apparent reason. One just suddenly becomes afraid, which can reach a point of feeling terrorized or it can simply remain as an instance of feeling attacked by anxiety. Whether or not one sees this as the activity of gods and demons, it is a problem, because this anxiety and terror is by its very nature disturbing and unpleasant. How does one deal with situations like this? One deals with fear of gods and demons in exactly the same way as one does with thoughts and kleshas. The first step is to recognize the presence of the anxiety or fear in one’s mind. Then one doesn’t try to stop, get rid of it, or to indulge in it. One simply looks directly at its nature with a mind that is utterly stable. As one looks at the nature of what one fears, one directly experiences its nature. One experiences that, in fact, it has the same nature as one’s own mind, the same nature as thoughts and kleshas, and has no substance. When one recognizes that an anxiety or fear has no substance, in one way one recognizes that there is nothing to be afraid of. Yet, in one sense, fear is still there and hasn 't vanished. Nevertheless, it has become meditation, because its nature is recognized. And having become meditation practice, even before it vanishes, it is no longer what we could really call fear even before it vanishes. By using the method of bringing fear, i.e., gods and demons, to the path, what would otherwise be an impediment to meditation is not only pacified through recognition of its true nature, but it actually turns into a beneficial source of one 's meditation. The fourth type of adversity to be brought to the path is suffering. A great deal of one’s suffering is sickness and death. But since sickness and death are such strong forces, they are dealt with separately as the fifth and sixth adversities to meditation. Suffering as the fourth adversity basically refers to two kinds of situations. First is when one feels miserable oneself, and second is when one sees others’ misery and becomes sad for them. The question is how to deal with both situations in meditation. Actually there are really three situations, because there are two possible reactions that practitioners tend to have towards the misery or suffering of others. These reactions occur when one witnesses the suffering from illness, misery, deprivation, poverty and so on, of others. One reaction that people might have is showing indifference. One sees someone and reacts with fear that the same thing might happen to oneself. One thinks, "What would I do if that happened to me? I 'd better practice so it doesn 't." Such feelings are those of a Hinayana practitioner. The second type of reaction that is characteristic of practitioners is having compassion. One sees that someone is miserable and realizes that there must be a lot of living beings all over the world that go through the same misery and pain, and one intensely wishes with almost unbearable compassion to help them. One wants to do something to alleviate their pain. Whether the situation here concerns one’s own misery, or the feeling of sadness that comes from witnessing the misery of others and being afraid of it, or the situation of sadness that comes from seeing the suffering of others and urgently wanting to help, the situation is fundamentally dealt with in the same way. First one recognizes the presence of sadness in one’s mind and then looks at its nature. By looking at its nature, one sees that one’s feelings are empty and have no substantial existence. While the sadness is still present, it is transformed into meditation, and once transformed into meditation, it is no longer a problem. The fifth type of adversity to bring to the path is sickness. Of course, sickness is suffering, but it is enumerated separately because it is so intense. How can one use meditation to deal with unavoidable suffering that is brought on by sickness? The idea is not to use meditation to replace medical treatment. Sicknesses can be either physical or mental and arises because physical bodies are composites, therefore impermanent and as a result subject to illness. One does experience physical and mental illnesses of various degrees and at various times in life. When they arise, one usually cannot take it and feels miserable. Bringing sickness to the path means to neither indulge in endless ponderings about how bad one’s situation is nor to deny how bad it is. One simply looks directly at the sensation of illness, of pain, or discomfort. By looking at it, one sees its nature. This does not mean that the sensation will cease. The sensation, of course, is extremely intense, and therefore it is very alive and real. When one looks directly at its nature, the clarity or vividness of the painful sensation is not diminished or eliminated, rather the experience of illness or pain becomes a state of meditation when one experiences its nature. Certainly, the illness does not cease and pain does not stop, but it is no longer quite the problem or source of misery that it was before one practiced. This method is also called “bringing sickness down from its pedestal,” which means bringing sickness and pain down to a level at which it does not control one and is not such a big problem anymore. There are two ways to go about this. One is to look directly at the sensation of sickness or pain and then to see its empty nature. The other way is to look at the nature of the mind that is experiencing the sensation. In either case, the result is the same, and bringing sickness to the path in this way will actually help a great deal. One might wonder how one can prepare oneself for this level of achievement before one is sick and in need. The way to prepare oneself is to pinch oneself, to pinch a little bit of skin, which hurts. It hurts, but not that much, so it 's good to start with. If one looks at the nature of the pain that one feels by pinching one’s skin, if one looks directly at it, one will see that it is empty and has no substantial existence. While observing or experiencing its emptiness, the pain is still there. The pain has not stopped, it still hurts, but because one is experiencing the emptiness of the pain, it 's not a problem anymore although it still hurts. When one develops stability in that practice, then one will more easily be able to deal with actual illnesses and more and more intense degrees of discomfort and pain. The sixth practice is to bring death to the path. Death is definitely going to happen to each and everyone. Once one has been born a human being or animal, there is no way to escape death. Everyone who has been born either has died or will die. Death engenders tremendous fear and sadness, and as a result one tries to avoid thinking about it and lives in denial. Denial of death is useless, since it 's going to happen one day. What one needs to do is cultivate some method by which one can transcend both fear and denial and by which one can die without fear and suffering. It is actually possible to accomplish this, and since one has no choice but to experience death, one really must find a way to get through it. There are many methods, but here the approach is based on Shamatha and Vipashyana. Death consists of three different experiences or stages. There is the experience of approaching of death, there is the phase of actually dying, and there is the phase after death. The suffering that arises by approaching one’s death is a combination of sickness and fear. It is fear of loss, the fear of losing one’s life and everything that goes along with one’s life. It also may entail a fear of what 's going to happen after death has occurred. In any case, seeing that it is fear, the way to deal with one’s fear of approaching death is basically the same as bringing gods and demons to the path. One looks directly at the fear and recognizes its nature to be emptiness. The second experience that arises when death occurs is the experience of dying. One’s body and mind were united during life and separate at death. Therefore it 's an experience that doesn’t resemble any experience one had during life and could possibly be terrifying. The practice of bringing death to the path is to prepare oneself for that experience by being able to look at the nature of dying with a relaxed mind while it occurs. Then the third stage is the experience that arises after death has occurred and one’s body and mind are separated. This stage is even stranger and more novel than dying itself; it is called “the after death interval,” the bardo. Since the bardo is so new, it is apt to be terrifying. So one prepares oneself so that one’s mind can be relaxed and is able to look at the nature of the experience itself at that time. Death is usually accompanied by great sadness and suffering and when that starts to happen, when one starts to feel very sad and forlorn, one needs to reflect what death really is. The first thing one needs to remember is that everyone dies, so there is no reason to fear death since it cannot be avoided. Simply thinking this way will help stabilize one’s mind somewhat. As to the intense sadness that death awakens, particularly if one is dying oneself, one has to remember that there is no reason to be sad, because death is by definition the most natural thing in the world and happens to everyone. By reflecting this way, one inspires oneself to win a perspective on what is taking place. That will somewhat reduce the intensity of one’s sadness and suffering, enough so that one can consciously recognize the appearances or experiences that arise as one comes closer and closer to the final moment of death. By not panicking as strongly as otherwise would be the case, one’s mind will be relaxed enough to be able to notice experiences that set in. When one’s mind is not seated in one’s body anymore after death, one will experience mind’s true nature. If one has already experienced it in meditation, then one will be able to recognize it after death. Furthermore, if one’s mind remains calm during the process of dying, then one will enter bardo calmly, which will make it easier to consciously choose one’s next birth. There is a meditation technique to become prepared for the experiences in bardo, the intermediate state between death and rebirth. One cannot experience the bardo while one still has a body, but it is possible to experience something that is similar and slightly less intense than what one will see in the bardo. In preparation for the visual appearances that immediately arise after death, the technique is to close one’s eyes so tightly that one’s upper eyelids press one’s eyes. After squeezing the eyes closed tightly, one first perceives darkness. But due to the pressure made by one’s eyelids, one will see a light of various colours, green, blue, yellow, and red and various figures. These are a little bit like what one will see in the bardo immediately after death. If you practice this while alive, what you see will be quite surprising. One can 't find a reason why one would be seeing these things simply by squeezing one’s eyes. But what one sees is the natural light, i.e., the natural display of Dharmata, which is the nature of one’s own mind and of all things. Dharmata does not exist outside oneself. While looking at this light and the appearances that do not disappear as long as one holds the meditation practice, one will be able to see their true nature, i.e., one will recognize that they aren’t external to oneself. Sounds that are of the same nature as the lights and appearances are heard during the bardo. One can practice to become prepared during life by clenching one’s teeth together. At first one won’t hear anything, but through practice one does start hearing a hum that eventually turns into a roaring sound. It is called “the empty sound of Dharmata.” By becoming familiar with these appearances and sounds during life, then one’s mind will remain relaxed when they are experienced in their intensity during the bardo. I have discussed bringing the six obstacles to the path. These six techniques teach how to deal with adversities that affect one’s life and meditation practice. But one needs to apply them so that they are helpful. You are extremely fortunate to be practicing Mahamudra meditation, to be studying and receiving Mahamudra instructions, and to be interested in it in the first place. As I mentioned earlier, Mahamudra is a very good practice. It does not involve anything that does not accord with a conventional lifestyle, so please do whatever formal practice of Mahamudra you can. Even if you practice it for very short periods of time only, you will benefit tremendously from practicing regularly for the rest of your life. Due to lack of time or other circumstances, some students may not be able to practice as they would like to and are sad as a result. But please don 't feel bad about that either, because even having had the opportunity to come into contact with these teachings and having the wish to practice them will benefit you greatly. Question: My question is on attachments and relationships, specifically with loved ones. How one can be a good father, husband, mother, brother, friend and yet maintain non-attachment. 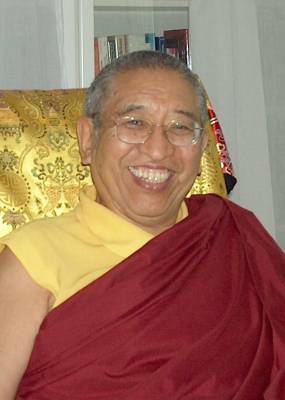 Rinpoche: Well, attachment and love are fundamentally different. Attachment is selfish; attachment makes us use people, whereas love is a concern for the welfare of others. Whether it 's your family, your spouse, or anyone else, it 's a concern that things go well for others, that they are happy, that they have what they need, that they receive a good education, and so on. So there is no conflict with being a loving husband and father. Attachment is something entirely different. Question: I 'm confused about compassion. You suggested that we should not feel compassion any more, but I feel sad if somebody is poor, like in the pictures that you have there. That is compassion in me. I do not want to kill that, because it inspires me to donate. I don 't understand that. Rinpoche: What you are referring to is bringing suffering to the path. The instruction was not to avoid compassion or to get rid of compassion. It was how to deal with the misery that arises in one’s mind when one feels compassion but feels frustrated when one can 't achieve everything one wants. So it 's not the case that you want to get rid of compassion. In fact, you need compassion very much, but you do want to be able to work with compassion without being disturbed by it. Photo of Most Excellent Thrangu Rinpoche courtesy of Katrin Weller from Stuttgart; edited slightly & arranged for the benefit of English readers of Karma Legshey Ling Institute in the Kathmandu Valley, with sincere gratitude to Most Venerable Khenpo Karma Namgyal, by gh, responsible for any mistake, 2007.